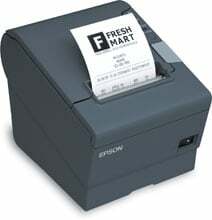 Epson TM-T88V - Thermal Receipt Printer, USB and Ethernet Interfaces, Auto-cutter. Includes power supply. Order interface cables separately. Color: Dark gray. The Epson TM-T88V POS thermal printer is the latest addition to Epson's industry-leading POS printer series. It offers fast printing up to 300 mm/second for both text and graphics, best-in-class reliability, new ease-of-use features and dual interfaces. In addition, the TM-T88V is ENERGY STAR qualified and offers print options that reduce paper usage up to 30 percent. Wall Hanging Bracket (for the Epson U220, T88IV, T88V, U230, T90, L90). 6ft Parallel printer cable. Replaces (Part# PCM-1100-06). Serial Connect-IT card. with 1K buffer. Cable, Null Modem Serial, DB-9F to DB-25M, 10 feet, Gray. The Epson C31CA85325 is also known as Epson POS Products	EPS-C31CA85325	.